Danny started life in the media as an ad organizer, but quickly stepped up to become a journalist at Hungary’s biggest daily paper, then made a jump to the best-known biking magazine from where life took him to a university in Brussels to study. When he returned, we snapped him up right away and since then he’s been our extremely successful editor of public affairs. 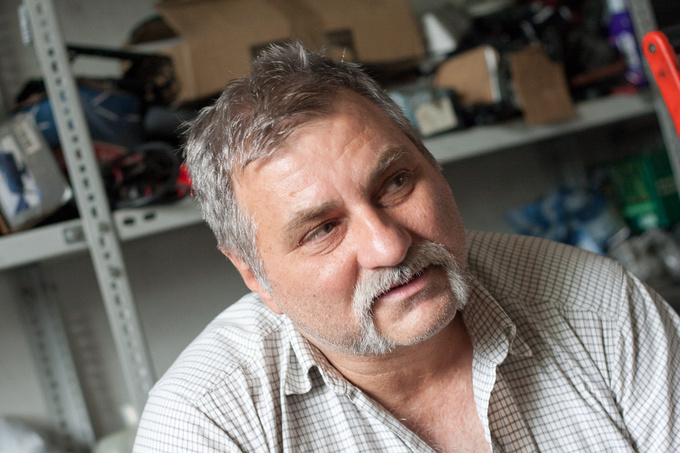 As a long-distance motorbiker, Danny also doubles as an editor at our mag for two-wheel lovers, totalbike.hu. Lives with a girlfriend, has a cat. The Smart Wizard operates in isolation. He couldn’t care less about white tiles in his workshop. He is no longer on speaking terms with the chairman of the local Smart club. He has had a few letdowns, but he carries on. There are mighty grand things going on in this hopeless uptown location. Here is a man who has found alternatives to maintenance instructions and exorbitant repair bills and can actually provide functional solutions to the many and varied problems of the infamous midget car. 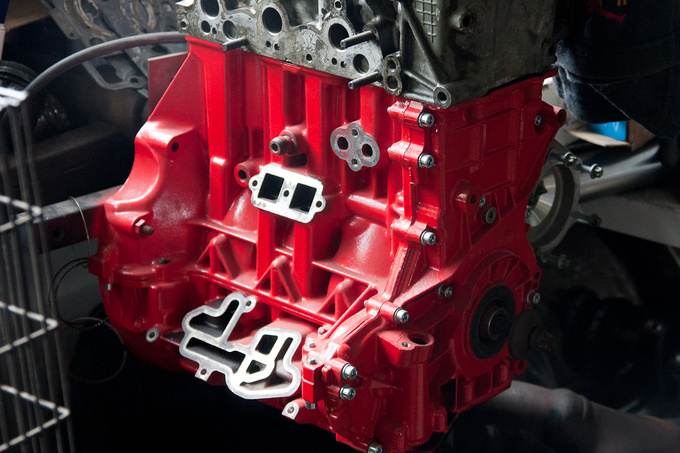 “I'll show it to you but you have to promise me you won't tell anyone,”he says as he lifts the greasy rug, revealing the merriest little thing in this mechanical sanctuary – an engine block painted bright red. Standing no taller than a sewing machine, it's sort of half finished. The cylinder head has been installed in place but the auxiliaries still need to be attached; it looks naked without the water pump, alternator and starter. Whether it's the overall workshop atmosphere, the greasy floor or the man's signature handshake (what is it with mechanics and their handshake anyway?) but I am beginning to believe that there is actually something of extraordinary importance going down here. I call him the Smart Wizard – to others he is just Les. And Les isn't happy. He has just severed ties with the local Smart club, a nasty story, indeed, and thereby lost much of his clientele, but he keeps on working. That's the only thing he knows. His attraction to these impossible midget vehicles, ephemeral and ostentatious, came about by chance but now it won't let him go. He used to be a rallycross racer, he worked in Germany and when he needed to start fresh he bought some of the infamous City Coupes and moved back home. Just in time to be drenched in the first wave of the crisis. But since he's got nothing else going he spends the entire day assembling and disassembling. He keeps learning. He keeps an eye on web auctions, he grumbles all the time but he will also casually learn how to weld an aluminum motorbike frame for a chance customer with a smashed up Yamaha touring. Over and beyond all this he is finding ways to improve the first generation Smart („the 450”, he calls them), a fundamentally failed design. He also curses a lot. He just cannot grasp how something can be such an illogical mess. 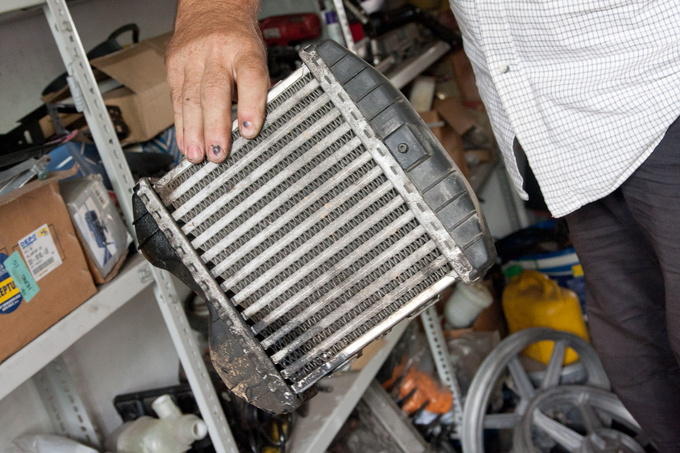 “Check this out,” he points to an intercooler, no larger than a handbag. “This thing gets rubbed out by its own mount. How can an engineer design something like that? It all begins with a tiny bit of oil leak. 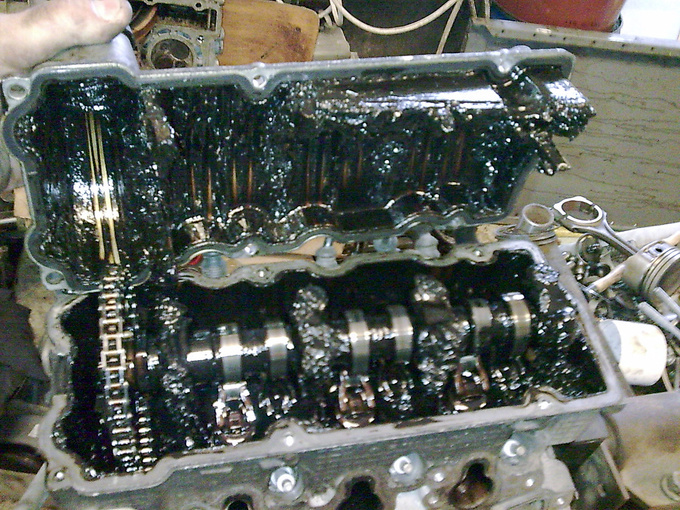 First it's the oil, then you lose charge pressure, and before you know it the whole engine is a goner. Sure, you can see a drop or two of oil under your car but you say it's normal, all Smarts are like that, so you don't even give it a second thought. But if you just pull a rubber hose over the edge of the intercooler you could avoid the whole calamity. A/C hoses rub too, and there is no easy way to replace those. You know what these thin wires do? 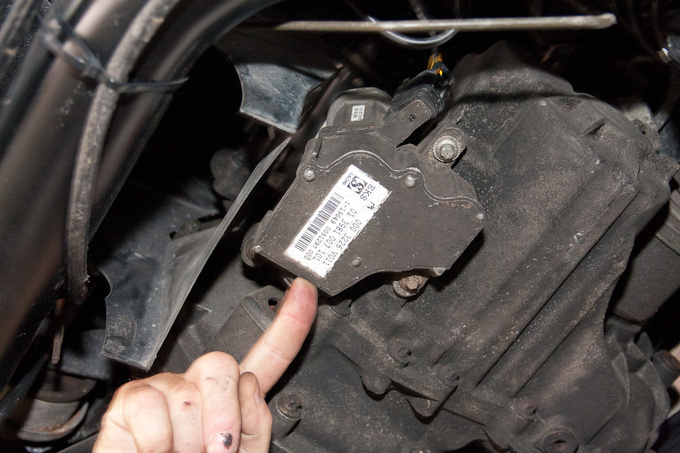 Yep, they rub, and then your car stops working.” He's got replacement hoses and wires hanging around the workshop walls. Needless to say, the former gives him more of a headache. Les is giving us a crash course in Smartism. He is a natural born educator. “Car thieves don't care for the Smart but there is a market for the expensive declutching motor. You get down behind the car, remove three bolts, and that's it. By the way that's another component that keeps breaking down. No-one has a clue why. I do. The releasing shaft bores through the clutch fork. For months now he's been trying to figure out a way to map out the Greatest Secret of All Smarts, the CAN-BUS electric system that drives independent mechanics up the wall. In case you don't know, this system, now generally and widely used in most passenger cars, uses less wires for more functions. Provided it works. The problem is that regular electrical repair methods are useless on this system.No, wait: the real problem is that it effectively blocks all attempts to soup up the engine. You need a diagnostic tool to get through it, and those are expensive. Friggin' expensive. But why should it be affordable? After all we are talking about a brand that has had a unique spark plug developed for the car, and the engine will not accept anything other than this NGK plug. That's why Les is constantly getting around the problem, trying to solve everything without having to get tangled up with anything electrical. Having discussed all of this I suddenly recall what Les stated in our first email correspondence. He said he was a grumpy man. I stumbled upon the Wizard by accident, spotting his ironic forum post trying to help someone with an issue that involved an engine block and a broken thread. Strange times are upon on me lately. I am on the verge of a coming out: to stand before the world and confess my weird lust for a Smart. Luckily it is still in the early stages, with a chance of an outbreak once or twice a year, but seizures will get more frequent as the price of used cars goes further and further down. So far the only cure that has worked for me is actually driving a Smart. Not a ForFour, of course not, that's just a wretched Mitsubishi Colt with boring engines. The original City Coupé (later known as ForTwo) and the Roadster, now those are the cool ones. Three cylinders, turbochargers, bucking like a rodeo bull, incredible gearshift delays, unique interior – yummy! We step outside into the drizzle. The workshop yard would be a perfect video shoot location for any punk rock / heavy metal band. Like most keepers of great engineering secrets he is a maverick and has therefore found himself a venue that people instinctively avoid, especially if they are afraid of surprises. Not that this uptown factory setting is completely without charm. There are the gas pipes, leading from nowhere to nowhere, a mechanic passing time with cheap paperbacks loaned from the library. Further away there is a man desperately gutting a washing machine while others are busy loading a truck with goods of unidentifiable nature. You may want to pretend that all of this does not exist but the fact is, this is an integral and unalienable part of Eastern Europe. The whole thing started out by accident, the Smart Wizard confides in me. He is not a car mechanic by trade but a body repairman. That'sa huge difference. He tells me about his former mentor, a legendary master of the sheet metal. The funny thing is, the Smart doesn't even have a body. Instead it has a Tridion cell frame with bolt-on plastic panels. What dents on a regular vehicle will snap, break or crack on a Smart. It can also dent on the rarest of occasions but then you wish it had cracked because you need to replace it anyway. 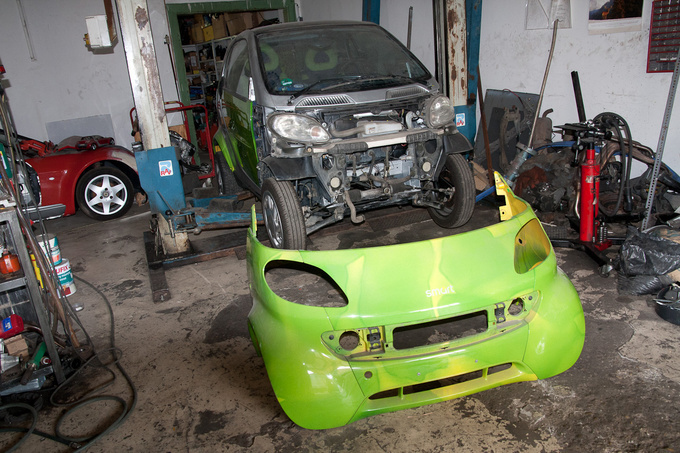 What makes the Smart completely unreal is that the entire frontal section can be removed. This is alright if you drive a Pikes Peak hill-climb racecar, but definitely dumb on a street vehicle. All the more so, since you, in fact, must remove the above mentioned frontal section if you wish to access the headlamps or the running gear. Need to replace a bulb? Good luck staying sane. This doggone thing is engineered for non-repairability. We walk the long line of three-cylinder blocks, pass along the turbochargers, hardly heavy enough for paperweight, and approach a jacked-up green City Coupe. “This one is for my daughter. Well, technically she is the daughter of my partner but it's like shewas my own, she deserves a nice Smart. I have even found seats in her favourite colour. This car is from the early 2000's but is not one of the very first models. Those had transverse leaf springs, this one sports a MacPherson up front, making it very similar to an actual car. 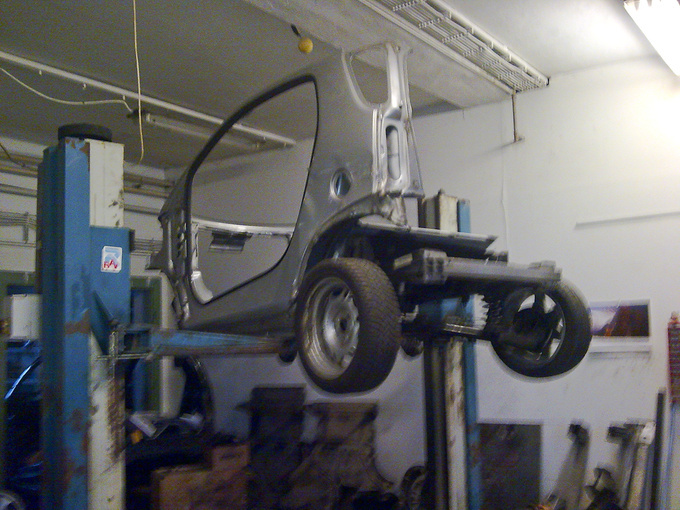 Think of it as a Trabant; although there are differences. 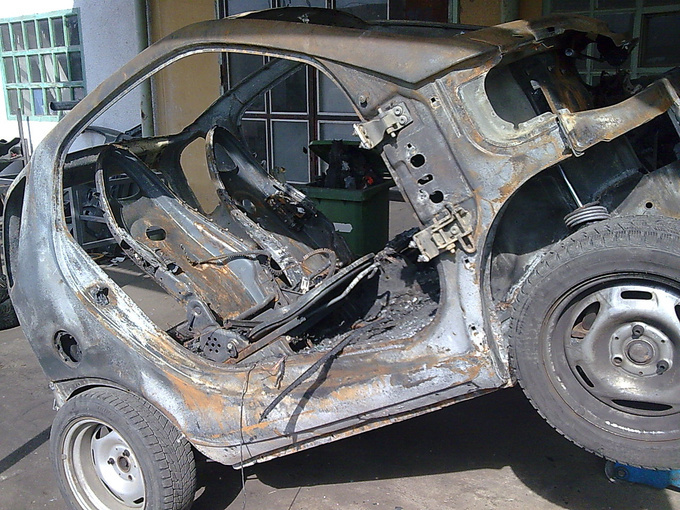 This is a fire damaged car that I have rebuilt from scratch. Try that with a Trabant after it burns out,” he laughs. 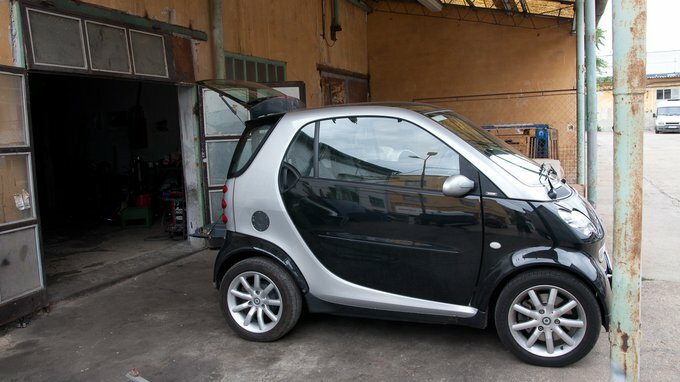 Did you know the Smart is a very short-lived car? Think of them as motorbikes. The problem is, customers buy them thinking these are cars. Regular models have no more than 60 PS, diesels 45, and yet owners drive them flat-out on the highway. This is the root of all evil. Most owners can't be bothered to change the oil either. They usually do fifteen, even twenty thousand kilometres on a single oil charge, while I believe the optimum interval would be 10K. It's like those warnings on cigarette boxes: Failure to change oil causes premature death of engine. Not that I blame them, mind you, even oil change were overcomplicated in the first Smarts.. There was no drain plug, you had to pump the oil out. Gee, when did the last oil change take place here? Les says this whole Eastern European Smart-boom began when the first generation started to get really long in the tooth and early copies could be picked up for chips in Germany. The oldest of Smarts are in fact teenagers now. “These are no longer fashion items, so they either end up dying a slow and expensive death in the hands of a dedicated but incompetent mechanic, or they find their way to me. 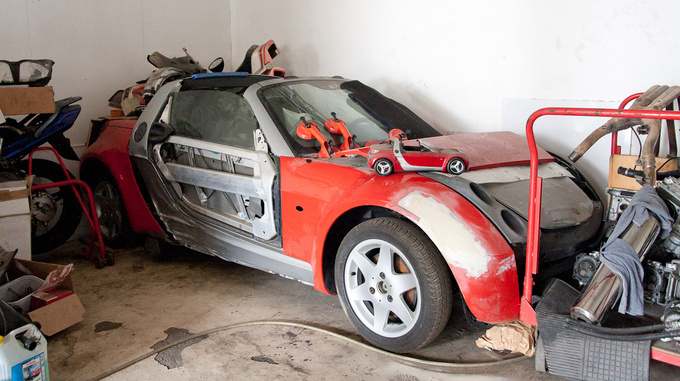 An authorised repair shop will easily charge you up to 1700 Euros for fixing the gearbox. Incidentally, this is where prices start for these vehicles. You are better off buying one that needs repairs anyway, though, that way at least you are not in for nasty surprises,” thus spoke the Wizard. 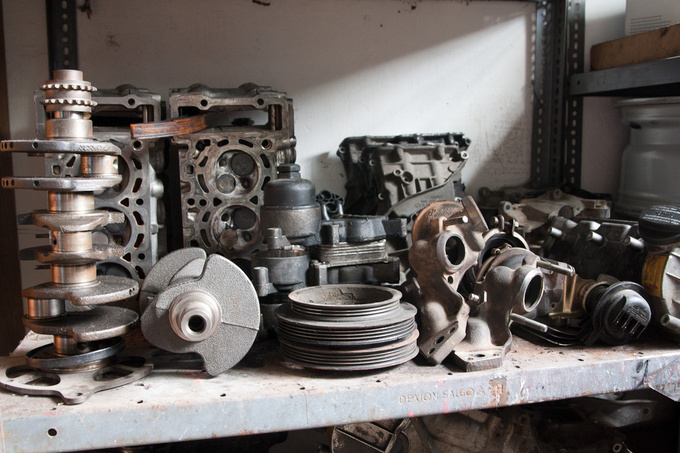 The workshop is not untidy per se but you could probably build a few functional engines from all the pieces lying around scattered on the floor. It's like Lego for adults. Examples? Take the hideous starter motor, for one. 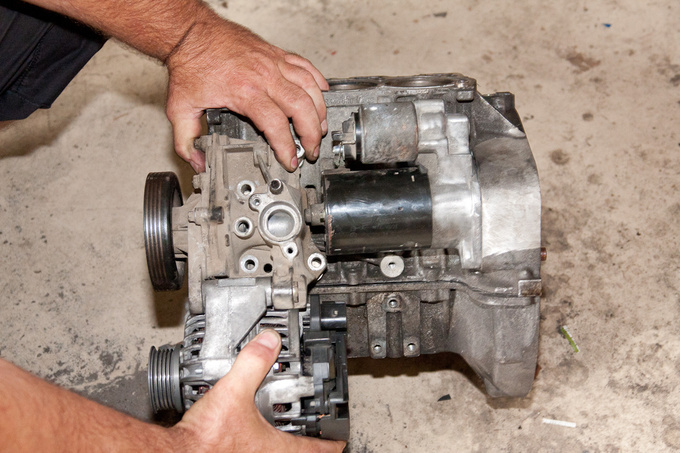 It is installed in between the water pump and the alternator and simply cannot be removed in itself, at least not on the diesel because that one has a longer motor. 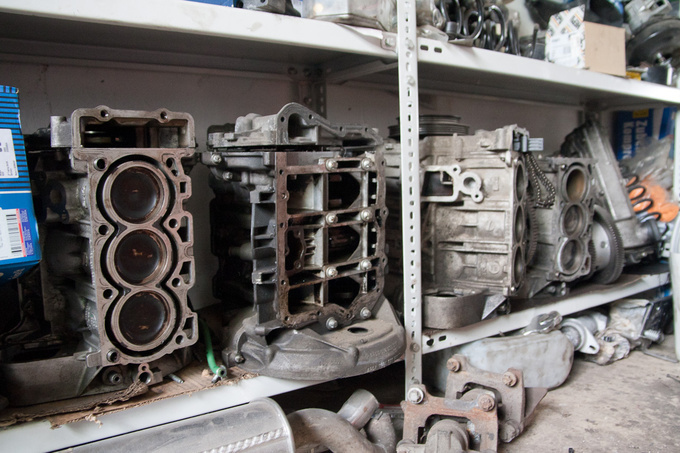 If you have a petrol model you can manage – or rather, Les can manage, because he knows the quirky moves and he has an utter disregard for factory repair regulations. He underlines his words with a paraphrase of the old joke about the gynecologist who passes the test for car mechanics. 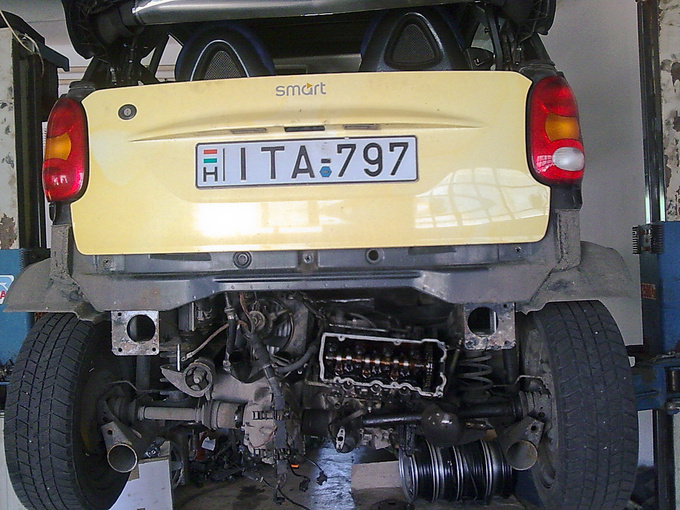 In his version it is the Smart engineer who, similarily to the gynecologist, gets 45 points out of the maximum 30 at his final test, and he can replace the alternator – like all the other mechanics – but he does it through the tailpipe. It looks like in Romania it’s no big deal if there’s a car parking on the road to be asphalted. The eager pavers always find a way.